With the changing economic climate and a real need for new structure and paradigms, been thinking a great deal about how we can change how the world works. And, living in a city like NYC, a lot of what I see that works (and what doesn’t work) needs to be extrapolated (and dealt with realistically) into the world at large. And, the web works in great ways (and not so great ways)… Steven Johnson talks about both and more from TED. I’d seen this posted all over, so here it is here. The Story of Stuff… Here’s the trailer, and go watch the whole thing… it’s an eye opener. Naomi Klein has a new book out, it’s titled The Shock Doctrine and it explores a topic near and dear, which is that the overuse of fear tactics by media and gevernment is creating an atmosphere of “collective shock”. It’s brilliant, timely and important stuff. Read an extract. Friend Douglas Rushkoff has a new article up over at Arthur and it’s a doozy concerning his take on the 9/11 “truth” movement. My two cents: 9/11 was an accident waiting to happen. Watch The Man Who Knew for starters… I’ll blog on this when I have more time, but my feeling is that if anything it’s a matter of incompetence and hubris. Whowouldathunk it? We can’t endlessly fool ourselves that nothing is wrong and that we can go on cheerfully pursuing our wasteful lifestyles, ignoring the climate threats and postponing a solution. Maybe there will be no major catastrophe in the coming years or decades. Who knows? But that doesn’t relieve us of responsibility toward future generations. Consider this: You’re a member of an ideological group that controlled Congress from 1994 to 2006 and the Presidency for 19 of the past 27 years. The past six years were the first time you controlled both Congress and the Presidency in generations and it’s all been a triumphant disaster. A total washout that has resulted in the loss of that control of Congress and the earliest start in a presidential election in the history of the nation. Your team is a bottom feeder. A loser. What would you do? Focus on mundane gossip and try to turn it into propaganda and get that wrong too! Seems wingnuts these days are so filled with hatred for anything and everything, they get the facts screwed up a bit. But, hey… hate is hate, right? … the fish enjoyed by the Gores were not endangered or illegally caught. Rather, the restaurant later confirmed, they had come from one of the world’s few well-managed, sustainable populations of toothfish, and caught and documented in compliance with Marine Stewardship Council regulations. How did the story get from People into an Australian tabloid? And how did it get from there to Jake Tapper? I did a Factiva search and found that this was the first time that the Daily Telegraph had ever printed an opinion piece from the Humane Society International, so I called Rebecca Keeble and asked her about the genesis of the piece. It seems that the first she heard about the matter was when she was contacted by the Daily Telegraph, told that Gore had served Chilean sea bass, and was invited to write an opinion piece. She didn’t want to tell me who it was who commissioned the piece, but it’s not hard to figure out. You see, the opinion editor of the Daily Telegraph is Gore-hater Tim Blair. He first blogged about the story here. Then he contacted Keeble and put her opinion piece in the Daily Telegraph. Next he put up a post linking to Keeble’s piece. Then it was picked by Glenn Reynolds and Matt Drudge who can be relied upon to run with any anti-Gore story they come across. Once Drudge had linked it, Tapper knew it was OK for him to run with the story. And that’s how it’s done. This isn’t the first time that Blair has used his position as opinion editor at the Daily Telegraph to advance his own personal agenda. See this post from Irfan Yusuf, on how Blair told Yusuf that the Telegraph would no longer publish him because Blair felt that he had been criticised on Yusuf’s blog. However, I’d still expect a guy on an environmental high-horse to have a bit more discretion, menu-wise. Yes, because there’s no difference between eating a fish caught on a fish farm where the breeding is controlled and specially monitored solely for the point of EATING IT, (you know, like we do with chickens and cattle) and a fish caught in the ocean where the breeding in not controlled and the species is over fished and is considered to be endangered. And, this nonsense propaganda movement continues, this time the genius at Little Green Footballs goes after Kirsten Dunst for wearing a Kaffyeh. The good folks over at Poor Man put this one to bed. It’s just patently stupid. But, when you’re team is the biggest loser in a generation… it’s the little things that make you happy. Facts schmacts. The important thing is that this story will be swallowed whole by the wingnut faithful. And, repeated ad nauseum as gospel. One more false reason to hate, one amongst many. 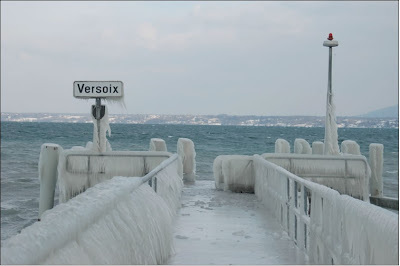 My sister sent me some photos of the aftermath of an ice storm in Versoix, Switzerland which are pretty extraordinary. Thought worth sharing some of them. Personally, I have to wonder whether Curt at Flopping Aces (and all those who think like him) are intentionally getting it wrong, simply refuse to engage the facts of the science, or just don’t get it. Because they continually get it wrong. Something is surely amiss. It’s become so ideological they are blinded. Who is Christopher Horner? He wrote the book “The Politically Incorrect Guide to Global Warming and Environmentalism” and is a senior fellow at the Competitive Enterprise Institute. Oil and oil dependent interests and a nice dash of theocrats for good measure. Not a non-partisan group to be sure. What do they have to gain by attacking global warming science? Money. Lots of it. So, Curt’s citing of a CEI Fellow as a source is dubious by definition. Given the list above, how could anyone ever think that such an organisation would actually support the global warming science one iota, given that they so ardently believe it threatens their profits? Would you? Doubtful. But, Curt apparently sees no problem with this at all. And, the icing on the cake: CEI has been accused in the past of deliberately misrepresenting scientific information. Classic. It gets even better. The truth is it’s an essential premise of the global warming science that the climate changes through time. It’s actually stated outright in An Inconvenient Truth a number of times (as anyone who’s seen it knows), and as this interview with two scientists from the National Ice and Snow Data Center shows. 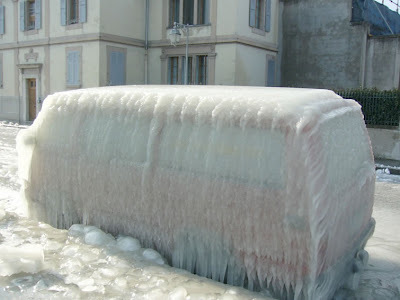 Brian: The glaciers are melting. You saw Al Gore just talk about that. 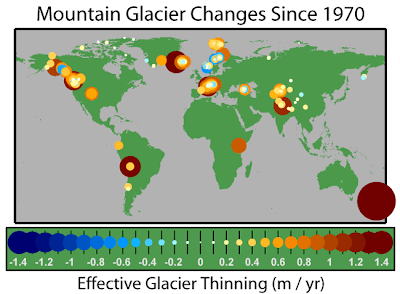 Horner: Yes, glaciers are melting all over the world. Glaciers are growing all over the world. The problem is…and also glaciers are receding by growing which is in Al Gore’s movie. When they grow too far – grow is the key word — they break off. That’s not melting he shows, that’s called calving. But what happens is they say melting glaciers is proof of global warming. By that logic, for lack of a better word, receding glaciers is proof of global cooling. They can’t both be true and in fact neither are. “Glaciers in most areas of the world are known to be receding […] But glaciers in the Himalaya are wasting at alarming and accelerating rates, as indicated by comparisons of satellite and historic data, and as shown by the widespread, rapid growth of lakes on the glacier surfaces. Most mountain glaciers worldwide have been retreating since the late1800s, and global sea level has risen about 15 centimeters since then. Okay, so that’s just one group of scientists. Granted, the USGS is pretty much the gold standard in these type of matters, but so what, right? There’s always someone who will disagree. Andrew Olmsted has an interesting angle on all of this which merits a read. Conservatives on Climate Change: Denial or Dumb? I’ve an online friend who is convinced that the Conservative attitude towards global warming is stuck in neutral not because they are in denial but because they are simply too dumb to get it. And, I’ve been resisting this perspective for awhile, but of late find myself leaning into it with a bit more interest. It’s a harsh assessment to be sure, but it does have some merit. Conservatives just don’t get the science. And, evidence of this fact is piling up all around. So which is it? Can they point out that it’s a bit warmer then usual during the winter but not point out when it’s freakin cold out at other times. 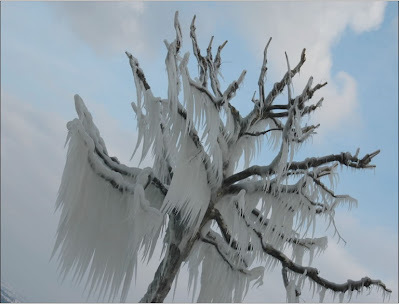 Is it a ice age or global warming? They don’t get the science. They don’t get that even a small rise in the global water temperature can have a myriad of effects – glacier melt for starters, which is incredibly well researched- that can have an overall affect upon seasonal temperatures, causing it to be unseasonably warm in the winter and then moving straight into a mini ice age in just a few days. They don’t get the science. In general, many Conservatives dismiss the established consensus by citing a minority, and the scientists in that minority are the same people over and over again. Some of them are even paid shills for the oil lobby. Shocking isn’t it? In the end, the right simply keeps repeating the same myths over and over and keeps raising the same objections (isn’t it global warming or an ice age?) which simply don’t engage the consensus science properly. They don’t get the science. This post at another Conservative site is typical of the “nothing is really happening and if it is we can’t do anything about it anyway” meme that seems to be growing ever more popular. They also do not get the science. As Atrios points out, when a professor at a major US university who also happens to be one of the most trafficked Conservative bloggers in the world doesn’t get it, we’ve got problems. Denial or dumb? Perhaps it is simply a matter of the lemmings waiting for their dear leader to announce it is all true. After all, the Pentagon is on board and has been for a couple of years. Either way, the end result is that they will be left behind in the dust. As usual. And of course, when the issue of the science is raised at a Conservative blog, the denial kicks in, as does the attack mode. The intestinal fortitude is low, and you’ll be banned for asking questions they can’t/don’t want to have to deal with. “the intellectual vapidity of the right-wing Ascendancy” over at The Poor Man. Dave at Seeing the Forest remarks on an alarming article on global warming in Salon. Which, of course, simply reminds me that the world moves in cylces, and politics moves in circles. What goes around comes around. In more ways than one. Bush tells Congress if they don’t do what he wants, he’ll take his bucket and pail and go home. If the Conservative Congress and the Conservative White House were truly run like a business, those responsible for the fiscal shape the country is in would be fired. Don’t forget to vote in November. Bonddad at My Left Wing has more on the BushCo. budgetary woes. Meanwhile, The Decider regurgitates the same old song and dance.